David Jeffrey (left) and Gary Hamilton. 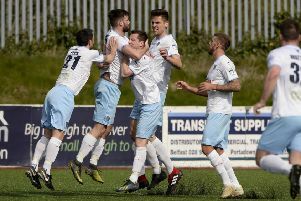 Pic by PressEye Ltd.
Ballymena United and Glenavon stand 90-plus minutes away from a result in the final fixture of the season which will provide the winner with a financial jackpot for future plans. Europa League semi-final wins on Monday - at the end of a gruelling Danske Bank Premiership campaign - have placed United and the Lurgan Blues with one closing test that could open up a summer of possibilities for either club’s rebuilding plans. Last season, winning the Europa League play-off was worth €215,000 to Cliftonville, who bolstered that windfall with a further €225,000 for reaching the second qualifying round. United boss David Jeffrey has described his squad’s progress to date as a “magical roller-coaster ride” that has left the club sitting fourth in the league and with a trophy in the cabinet. “Irrespective of what happens, it has been a magical roller-coaster ride of a season thanks to so much hard work by so many people,” said Jeffrey. “We came into this season aiming to meet a number of objectives, from avoiding a relegation fight, to securing a top-six place then setting down the challenge to the players to see how high we could finish. “We ended up fourth, the club’s highest league position since 1981, plus with a first major trophy in almost three decades in winning the League Cup. Glenavon manager Gary Hamilton wants the fans to turn out in force for the final fixture of the season. Hamilton has been quick to highlight the role played by the away fans in Belfast for the semi-final and is keen for another show of support tonight. “Our fans have proven in the past they turn out in big numbers for our biggest games and we certainly appreciated that backing against Cliftonville,” said Hamilton. “More of the same would really help the players on the pitch in the Ballymena match and our supporters can offer a genuine boost. “It is going to be the last game of the season and, potentially, the last time some of the players will pull on a Glenavon shirt.